Our team applies what we call the ‘vested interests’ approach to build relationships and deliver services to our partners. We believe by committing to help our partners learn, we are helping set the foundation for the long-term success of both the individuals and the companies we work with. 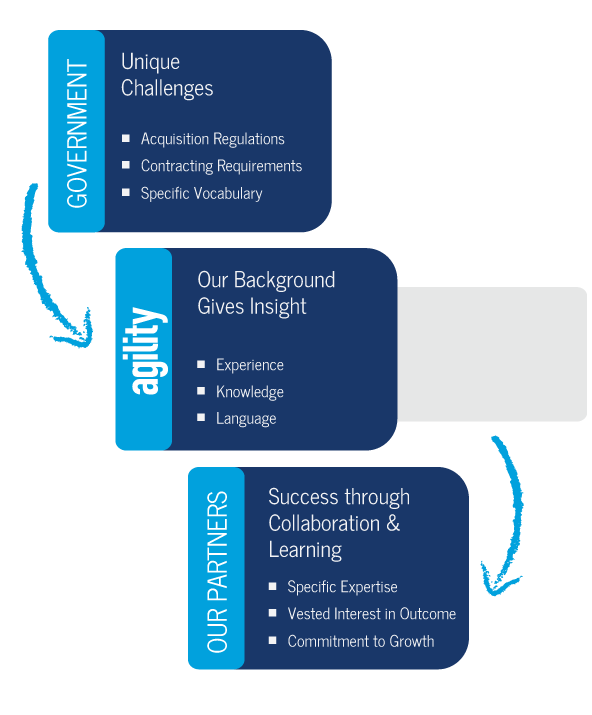 In essence, we believe our partners and Agility Development Group have a vested interest in each other’s success. Although our team has a diverse background, which includes service in Government, private industry, and education, our core values and philosophies are the same and rooted in helping others make a difference. Each of us at Agility has found committing to others and helping them achieve success can accomplish more positive change than one can possibly imagine at the start of the journey. Simply put, we have a vested interest in each other’s success and look forward to seeing what can be achieved together with your team! Our extensive government background and vested interest approach allows us to deliver superior services to our partners.